Whilst sorting through my kitchen drawers recently I stumbled across a number of plastic medicine spoons I had collected over the years. Now I like to think that I'm quite a green person as I really don't like to throw anything away unless it's broken and beyond repair and would definitely not have any use to anyone for anything. So I thought I'd have a good think and do a bit of searching for ideas on what I could do with them. 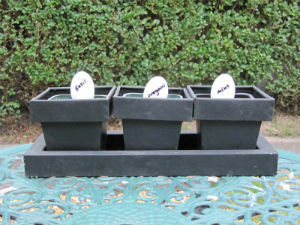 Then suddenly it dawned on me that they would make novel little plant labels. Every year I grown my own vegetables and label the pots with sticky labels that eventually fade or fall off, labelled plastic spoons would work much better. Use a permanent marker, label the underside of the spoon and push it in the soil of your plant pot with the little handle. Hey presto, some cool sturdy plant labels plus it saves them being thrown in the bin and eventually ending up in a landfill. How about making something with them? I'm sure with a little imagination you can come up with many craft ideas, especially with kids. I'm not a very arty/crafty person but I came up with an idea - you could make little people with them. Draw a face on the underside of the spoon, twist the top of a pipe cleaner round the handle so you have the main body, then twist another pipe cleaner across so you have arms and there you'll have the beginnings of a little person. You could even stick little pieces of wool on the top of the spoon for hair and make little clothes out of felt. Just let your kids' imaginations run wild. Another use could be in making a home-made educational toy such as an anemometer. With 4 of these plastic medicine spoons and a few other items you may have lying around the house you can make a very simple one which could entertain the children and potentially introduce them to meteorology. In this video I have simply taken an ordinary wine bottle cork and with a pen knife made 4 slots big enough to wedge the spoons in. They need to be configured in such a way that opposing spoons are facing in different directions. You then take a bamboo skewer and insert it into the bottom of the cork. The skewer can be inserted into a drinking straw and it should then be able to rotate freely. If you don't happen to have any plastic medicine spoons I'm sure normal plastic spoons would work well too.